Brown County is located in East Central WI between Sturgeon Bay and Appleton on the Eastern Middle part of the state. Brown is more of a Green Bay Packers Territory than anything else with plenty of frontage on Lake Michigan a couple larger communities including; Green Bay, Bellevue, Ashwaubenon, De Pere and Suamico to name a few. It's surrounded by 6 other Counties; Oconto, Shawano, Outagamie, Calumet, Manitowoc and Kewaunee. On this site you can search for Hobby Farmettes, Fish Farms, Tillable, Dairy Farms, Sustainable Agriculture, Ag Land for Sale, Small Farm Acreage, Cropland, Barns, Ranches for Rent, Horse Pasture, Organic Farming and more located in this county listed by a real estate agents. 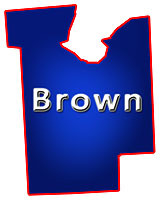 Brown County, Wisconsin GIS MAP Information!